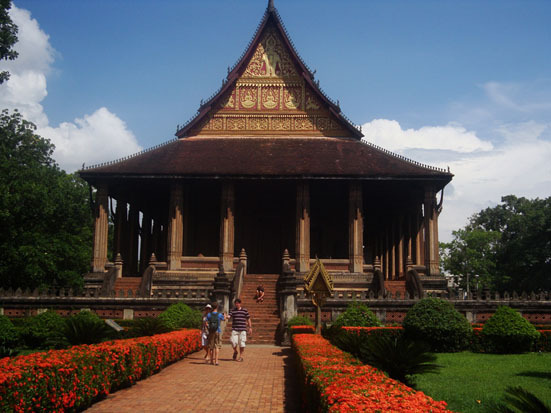 This tour combines all the south of Laos has to offer, with the major destinations in the rest of the country. 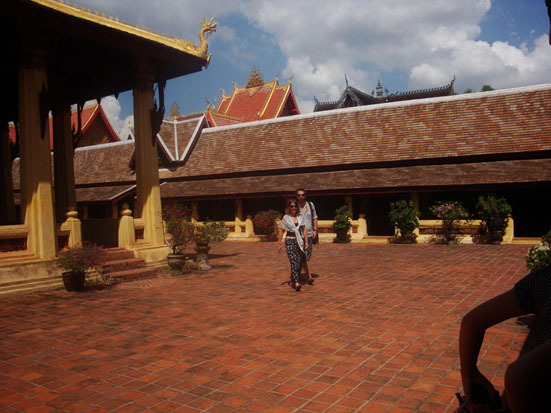 The main differences with the shorter version are: more time to explore and 2 extra days in Luang Prabang. 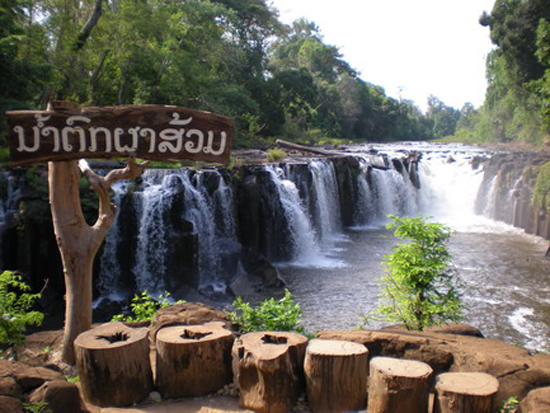 The south of Laos holds some of the most spectacular waterfalls and other natural sites of the country. Learn about the interesting tribal cultures in this area and visit the ancient Khmer temple complex of Wat Phu, a UNESCO World Heritage Site. Deep in the south, the Four Thousand Islands provide an ideal place to relax. 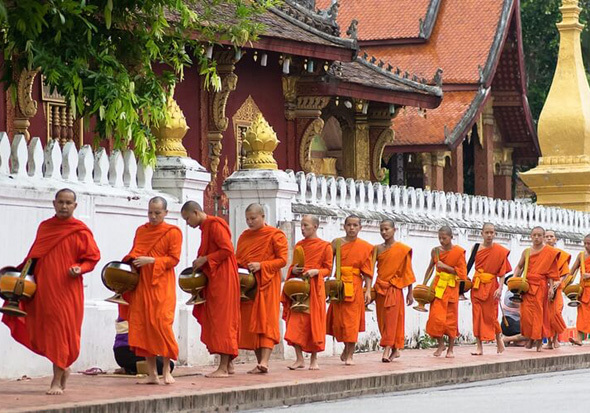 In central Laos you will visit the laidback capital Vientiane, the mysterious Plain of Jars and World Heritage city Luang Prabang. The trip also involves many river cruises. Welcome to Vientiane. Upon arrival, Meet your guide and transfer your hotel. Overnight in Vientiane. 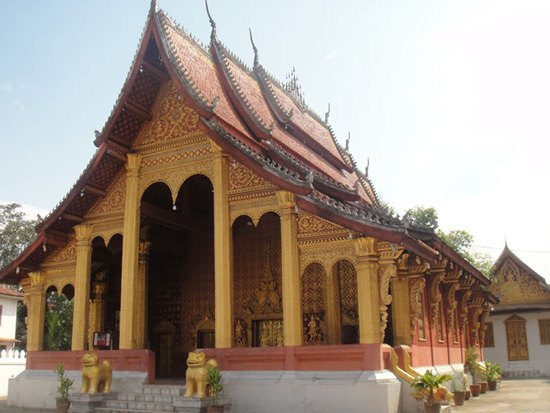 After breakfast, Meet your guide and we start visiting the major sights of the capital; including the oldest Wat Sisaket, the temple with thousands of miniature Buddha statues and the former royal temple of Wat Prakeo previously housed the famous Emerald Buddha Image. 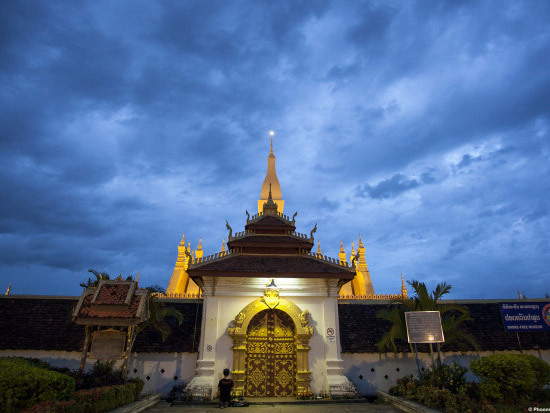 On the way to the famous and sacred structure of That Luang Stupa, we stop to take some pictures of the imposing Patuxay Monument, which is well known as Vientiane’s own Arc de Triumph. Afternoon, Visit COPE Center before we start to visit the major sight out of town about 30 km, visit Buddha Park, a blend of Buddhist and Hindu sculptures created by mystical monk on parkland located by the Mekong River and the impressive Lao- Thai Friendship Bridge. En route stop at Lao/Thai Bridge, taking photos before continue to the park. Return to town late afternoon. Overnight in Vientiane. Around 0630am, Meet your guide and transfer you to Wattay Airport to t a flight to Pakse. Upon arrival, you are met and drive ahead to boliven plateua. The stumbling water and lush vegetation around Tad Fan waterfall of today’s Atacular. We make a stop en route observing the traditional local making tea and coffee, a cup its can be tasted prior exploring the local cultures and its way of life along the way to Boloven Plateau area, the cultivation of rich coffee, tea, cardamom, bananas, and other crops are being seen along both side of our way. 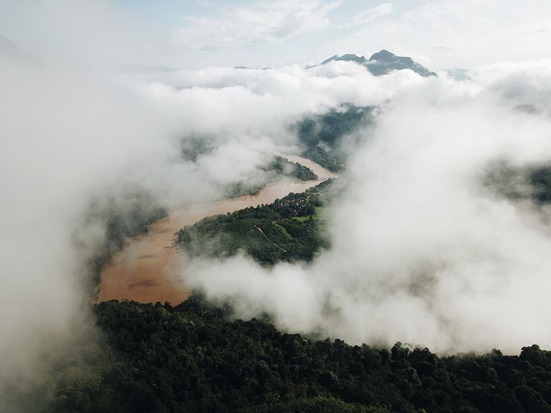 This is allowed time for visitors to venture off the beaten path and explore some of the lesser-known areas of Laos pointing for full exploration of the wild beauty of this southern region. During the boliven plateau tour, You will visit Tadfane, Tad Ueaung and Phasoum water fall. Return to Pakse late afternoon. Overnight in Pakse. After breakfast, Meet your guide and we are heading out toward Khong Island, keep our way, crossing Mekong ferry to visit the pre-angkorian, ruins of Wat Phu, one of Southeast Asia ‘s most dramatically situated temples. 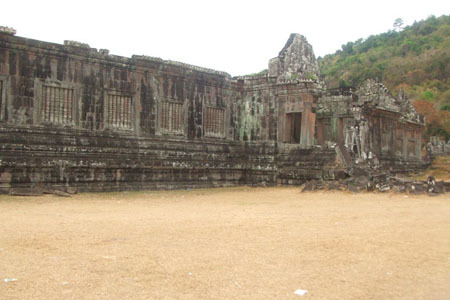 Explore these Khmer ruins, perched atop a nearby hill, which is one of Lao World Heritage site recognized by UNESCO in 2001, this wonderful archeological site of Khmer civilization dated back to the 9-12th centuries. We continue our way to 4000 islands region. Overnight in Don Khong. 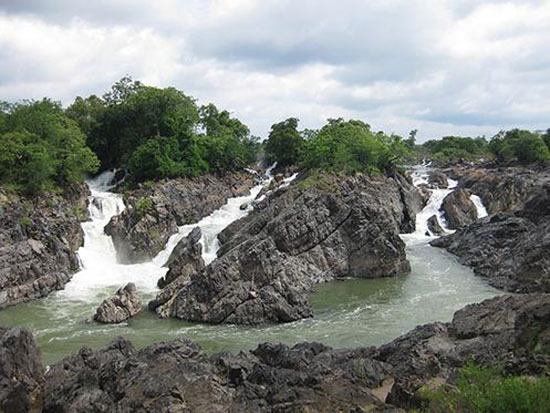 After Breakfast, Meet your guide and we enjoy a visit of the surrounding countryside, and board on a long trail boat touring to Don Khone area, taking you to visit the remains of French period, Liphi Waterfall or “the Corridor of the Devil”. After that take a long trail boat from Hang Khone village to visit Dolphins area. If you are lucky, You can will see those dolphins. After that, You have a chance to observe local fishermen trapped fish by nets along Khong river. Overnight in Khone island. After breakfast, Meet your guide and We return to the mainland at Ban Nakasang, a fishery village and drive further south to visit Khone Phapheng on the journey, the biggest waterfall in the South East Asia, it is really the impressive sight then a lush vegetation near the Lao-Cambodian border, which is teeming with wildlife and it is one of the loveliest destinations in Laos. After that return to Pakse and transfer to Pakse Airport for an evening flight to Luang Prabang. Upon arrival, Meet your guide and transfer to your hotel. Overnigth in Luang Prabang. As an optional, Today you may want to get up early to participating an Arm-Giving, hundred of monks walking along side walk to collect rice and food from laymen. We then visit Fresh morning Market at Prakham village to see local lives. 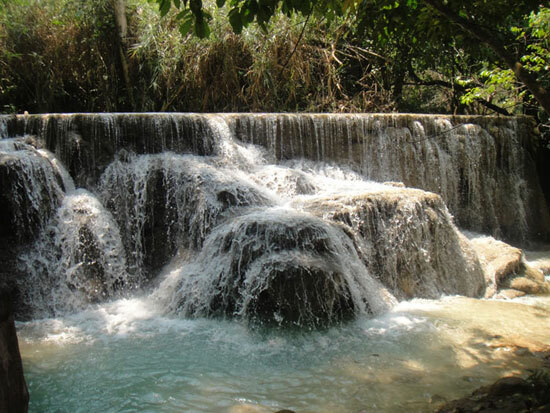 Afternoon, We then drive out of town 30KM to the beautiful Kuang Sii Fall, where you can swim, relax, soft trek to the top of the fall. 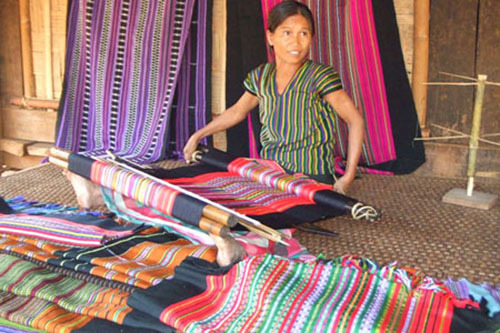 On return short stop at Black Hmong Village (Ban Na Ouane), where hill tribe hand-made handicraft as souvenirs for visitors pass by. Arrive in town, Visit Wat Prabath Tai, very nice view during the sunset along Khong river blank. Overnight in Luang Prabang. After breakfast your guide and private car will pick you up from you hotel and you will drive approximately 3hours to Nong Khiaw. 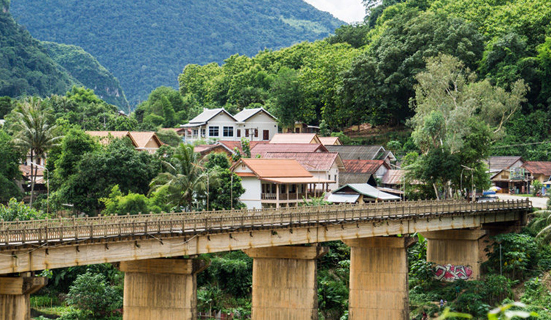 After checking in to your hotel you will enjoy lunch at Nong Khiaw Riverside. 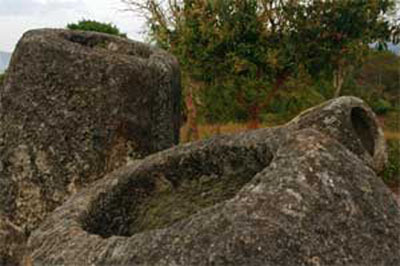 Afternoon, Visit the historical cave of Phathok. The Nong Khiaw villagers used this cave as a war shelter during the “Secret War”, to shelter people from bombs dropped in the region. 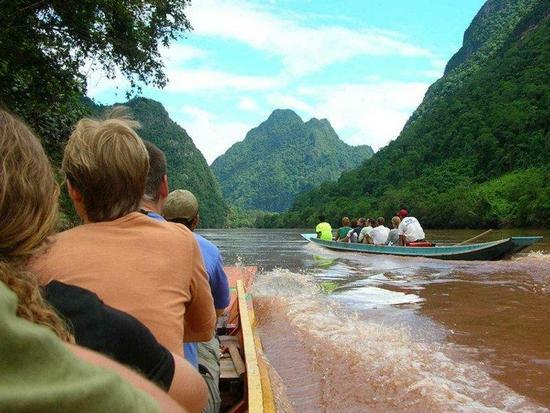 It is about a 30 minute gentle walk from Nong Khiaw town and takes you through beautiful scenery. 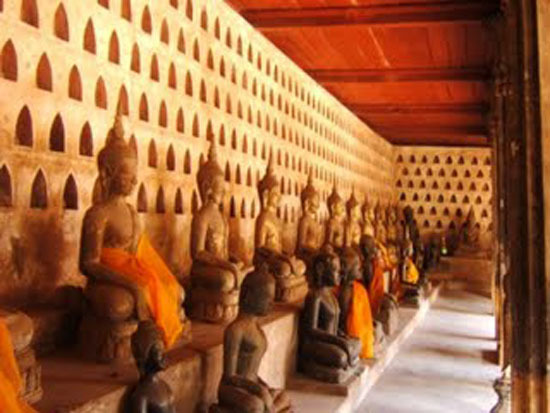 Learn more about a secret part of the Lao history and explore the historical caves with your guide. From the cave you will have a beautiful view of rice paddies and the valley. Walk back to Nong Khiaw along a small path through the rice paddies or Hiking up Nomg Khiau View Point about 1hour & half hiking. You can see the whole view of the town, Take nice photos, relax. After that hiking down to the ground around an hour. Overnight in Nong Khiau. 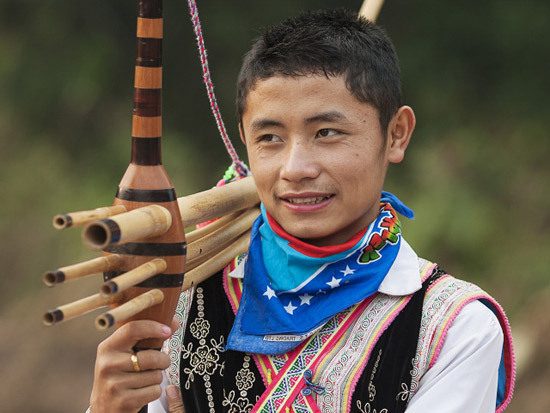 After breakfast, Meet your guide and We begin a boat trip up along Ou River about 1hour & half to Muang Ngoi and we then continue a boat trip upstream along Ou river about 40minutes to Sopcheang Village, where Lao Loum, Lao Terng and Kamu live there. Along the way, you can see stunning view of the landscape and its beautiful nature. Arrive the village, walking around to see local live. After that return to Muang Ngoy for lunch. After lunch, Walking around the small town to see local lives and its beautiful landscape, relax, take nice photos. Late afternoon, Cruise down along Ou river back to Nong Khiau. Overnight in Nong Khiau. Around 0830am, Meet your guide and enjoy a boat trip about an out down stream along Ou river to Donekhoun village to see lives. Some Hmong, Lao Terng and Kamu live there. You then start soft trekking few hours you will see only water and jungle and hear the sound of clear waterfall cascades. The pools around you are very inviting for a refreshing splash. Your guide will lead you through the cascades and prepare a local style lunch on the falls in the middle of it all. 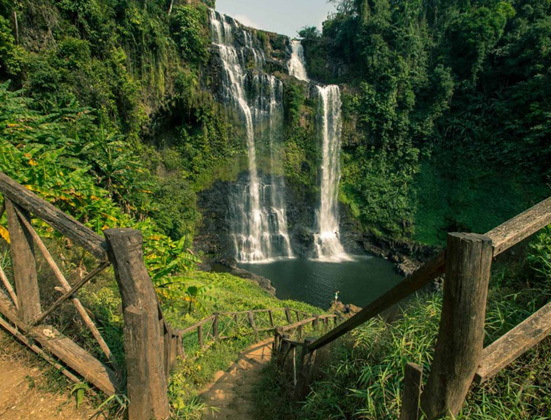 Then we’ll take a small villagers’ trail from the top of the falls back down into the valley; along the way, you’ll take in views of the landscapes of the Nam Ou valley. Hiking back to the village, we’ll have more time to observe the daily life here before heading back by boat to Nong Khiaw. Estimated arrive in Nong Khiau around 1500pm. After breakfast, Meet your guide and We return to Luang Prabang about 2hour & half drive. 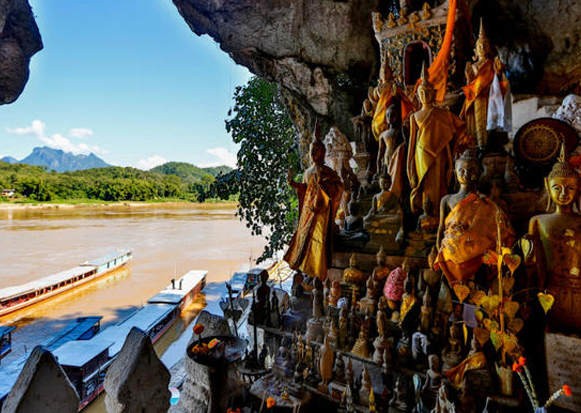 Arrive Ou village, take a boat cross Khong river visit to the mysterious of Pak Ou Caves, crammed with thousands of gold lacquered Buddha statues of various shapes and sizes. We then continue cruise down to Luang Prabang. 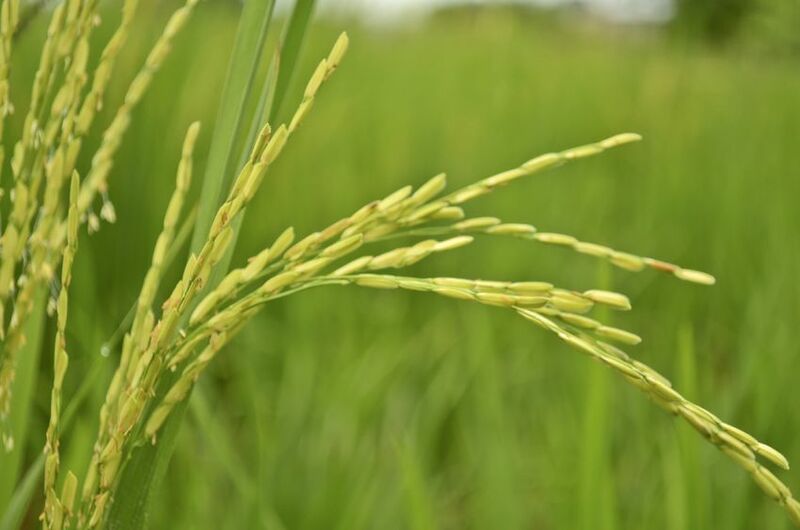 Along the way, we stop at the village of Ban Xanghai, where they make the distillation of local rice wine. 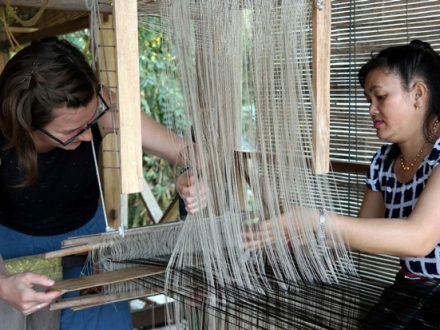 On return, we take a short drive to Ban Xang Khong, well known for its hand weaving. Overnight in Luang Prabang. Around 0830am, Meet your guide and we are driving about 7hours to Phonsavanh, which was devastated by American bombing between 1964 and 1973. 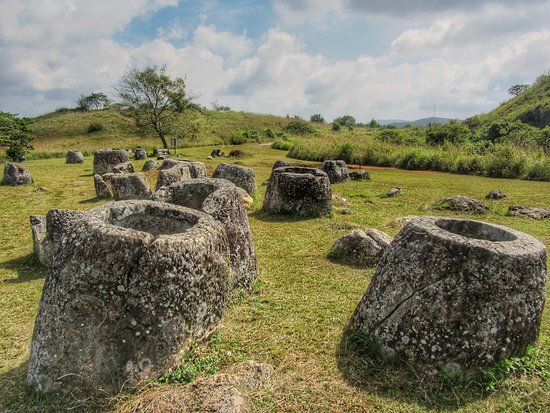 Upon arrival, We drive out to visit the Plain of Jars, an impressive archaeological site 1 where hundreds of large stone jars are littered all over the plateau. Return to town, Visit MAG Office, where displayed about bombing film during the Indochina War. Overnight in Phonsavanh. Around 0830am, Meet your guide and Visit Phonsavah market to see local lives before we drive out to visit the lain of jarst site 2 & site 3, both similar to site 1 but smaller than site 1.After that, We continue visit the old capital of Muang Khoun Province and the nearby villages, home to the Hmong hill tribe and Tai Dam people. 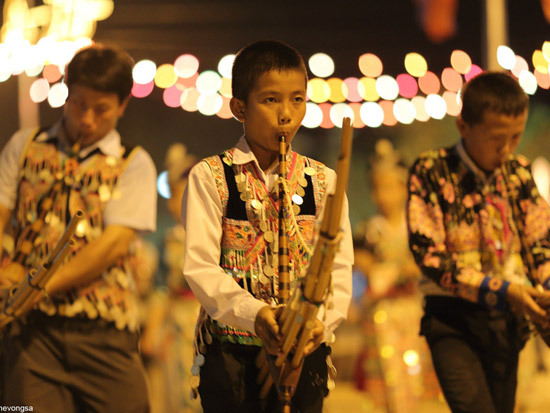 They have an interesting local culture and a colorful history. Some stupa, former French building, temples bombed by US Army during the Indochina war still be seen there. Return to town afternoon, and transfer you to Phonsavanh Airport for a short flight to Vientiane. Upon arrival Wattay Airport, Meet your guide and transfer to your hotel. Overnight in Vientiane. Today, You are free and relax until your flight time, Meet your guide and Transfer you to Wattay Airport for your departure to yoru next destination. Wish you enjoy the rest of your vacation. Please make your choice below or contact us for other suggestions. The pricing for this tour varies according to group size and time of year. Deposit 20% of total amount after confirmation of the tour packages. Total payment should be made 25 days before tour start. sharing twin room with 2 adults in the same bed is free of charge (if an extra bed is needed, charge is as described below).